Strathwood has broadened its handsome collection of cast-aluminum furniture with the St. Thomas ensemble. For celebrating outdoors, this small cast-aluminum side table is cleverly designed with a recessed stainless-steel container for holding ice. A bottle of white wine or Champagne inserted into the ice stays chilled even on a hot summer night. When no ice is needed, the 11-inch-diameter lid stays flush with the rest of the table surface. A round knob allows the lid to lift up easily for access to the ice bucket. Measuring 24-1.13 inches in diameter by 18.31 inches high, the low table is just the right size for tucking between two Strathwood cast-aluminum armchairs or chaise lounges. It weighs approximately 16-1/2 pounds. Brightly polished and rust-proof, the stainless-steel ice bucket is 7 inches deep with a top diameter of 11 inches tapering to 9 inches at the bottom. It hangs by its wide rim and removes for cleaning. To keep a flute of bubbly from toppling over on the table, screw-on glides underneath the table legs allow some leeway in adjusting for uneven surfaces. 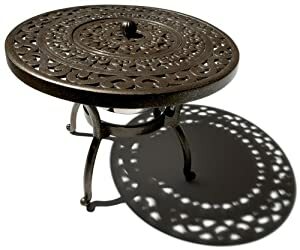 The top surface of the table is beautifully designed with an ornamental scrolling vine motif in a dark-brown finish with bronze highlights and silver flecks. Its open scroll design provides a smooth, even surface so dishes won’t tilt off balance, and allows rain water to fall through and dry out. The all-weather, easy-care St. Thomas furniture is made from the highest grade of aluminum. Pieces are sand casted, covered in a powder-coat finish, and designed to be rust-free. Some easy assembly is required on arrival.